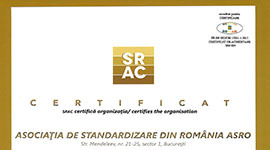 National Standardization Body – ASRO – is a Romanian legal person of private law, a public interest, non-profit, non-governmental and apolitical association which operates in compliance with Law 163/2015 regarding national standardization and Government Ordinance 26/2000 on associations and foundations. We establish the national standardization principles and methodology. 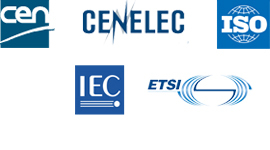 We develop and approve national standards and participate in the European and international standardization work. We manage the collection of standards and publications in the field of national and international standardization. We provide public information in the field of national standardization. We edit, publish and disseminate standards and standardization publications. 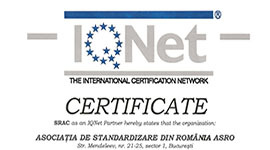 We represent ISO and IEC in Romania and defend copyrights on the international standards adopted. We offer products and services to standards users in order to meet their specific needs. We promote copyright compliance on the European standards adopted. ASRO grants national compliance marks such as RS (compliance with Romanian product standards) and RS-S (compliance with Romanian safety standards) upon request.